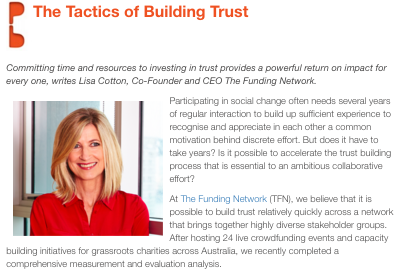 The Funding Network Co-founder and CEO, Lisa Cotton, featured on Pro Bono Australia about why trust is the key to ensuring a powerful return for everyone. Participating in social change often needs several years of regular interaction to build up sufficient experience to recognise and appreciate in each other a common motivation behind discrete effort. But does it have to take years? Is it possible to accelerate the trust building process that is essential to an ambitious collaborative effort? At The Funding Network (TFN), we believe that it is possible to build trust relatively quickly across a network that brings together highly diverse stakeholder groups. After hosting 24 live crowdfunding events and capacity building initiatives for grassroots charities across Australia, we recently completed a comprehensive measurement and evaluation analysis. One of the key themes commonly cited in the interviews was “trust”. Over 90 per cent of audience participants said that TFN events, delivered by a brand they can trust, supporting charities they feel confident in, was a powerful combination that influenced their giving. Recognising that, regardless of size or influence, no single organisation can (nor arguably, should attempt to) advance social change on its own. Our approach has always been to ensure that our work is part of a larger, more diverse and powerful effort with “trust for impact” sitting at its heart. With a network built on trust, our potential to scale has dramatically increased. We started with this approach back in 2012 while we observed TFN in the UK with a view to replicating the model in Australia. We established a national steering committee made up of cross-sector leaders to help guide our thinking. The following year, we undertook extensive community consultation and network briefing sessions in Sydney, Melbourne and Perth to understand the issues and opportunities to introduce a new giving model to what are reasonably nuanced philanthropic markets in each state. The consultation and briefing phase culminated in pilot events to showcase the potential of TFN. And the response? Well, it was overwhelmingly positive and, from there, TFN Australia was officially launched. But that’s not all that this initial phase delivered. The credibility and the relationships formed in those early days provided the foundations critical for building authentic bonds as we created the infrastructure to mobilise collective action. This has enabled us to maintain momentum in growth from the very start by creating a more open, fast and collaborative model.